I have been enjoying seeing my own garden grow and change during Chelsea week. 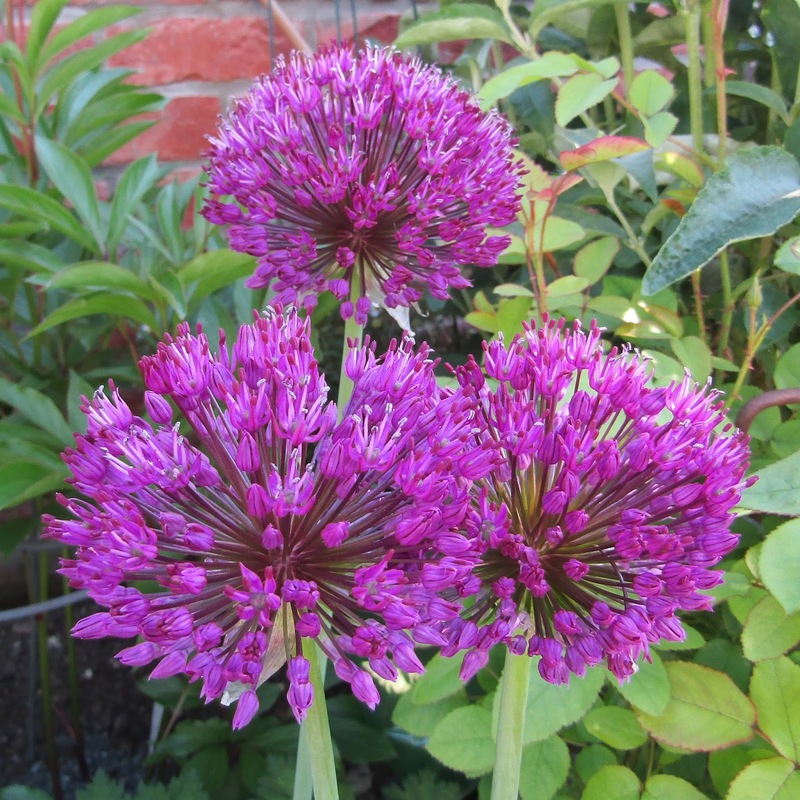 It's always about the alliums and I have two varieties, Purple Sensation and Christophii. Above is Purple Sensation. This aquilegia has self seeded, but it looks good here. Allium Christophii starting to flower. 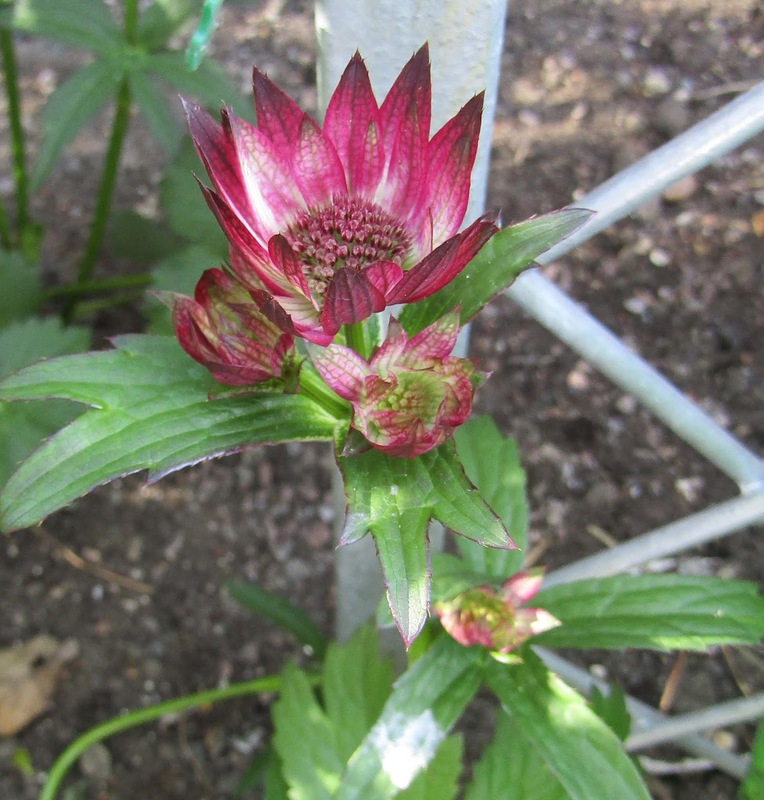 A lovely red astrantia given to me by a colleague at work. ...and more. I don't remember planting these here, but they look happy. 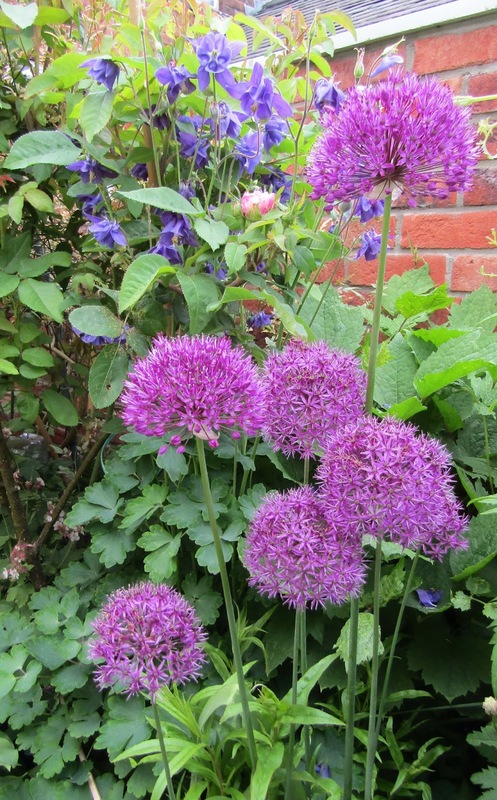 This is my favourite combination in the garden at the moment - allium, a blue (quite tall) aquilegia and a single rosebud. Nature does put things together so well, doesn't she? 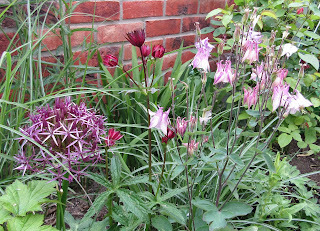 Another pretty combination of allium christophii, the pink aquilegia and another red astrantia from my colleague at work. It will soon be rose season and I always love that. May/June is my favourite time of year. Thanks, Cheryl. 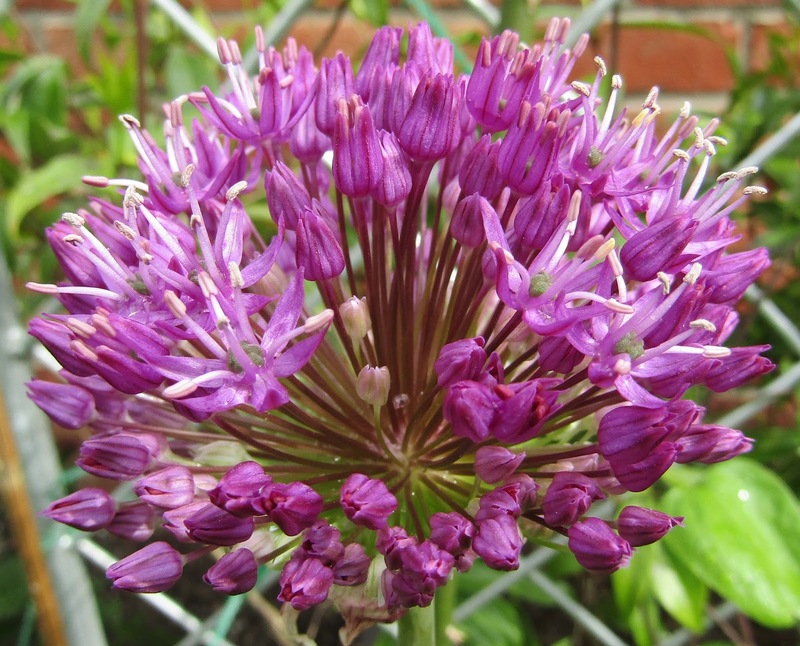 I am thinking that I need a few more, to continue the splashes of purple down the border. 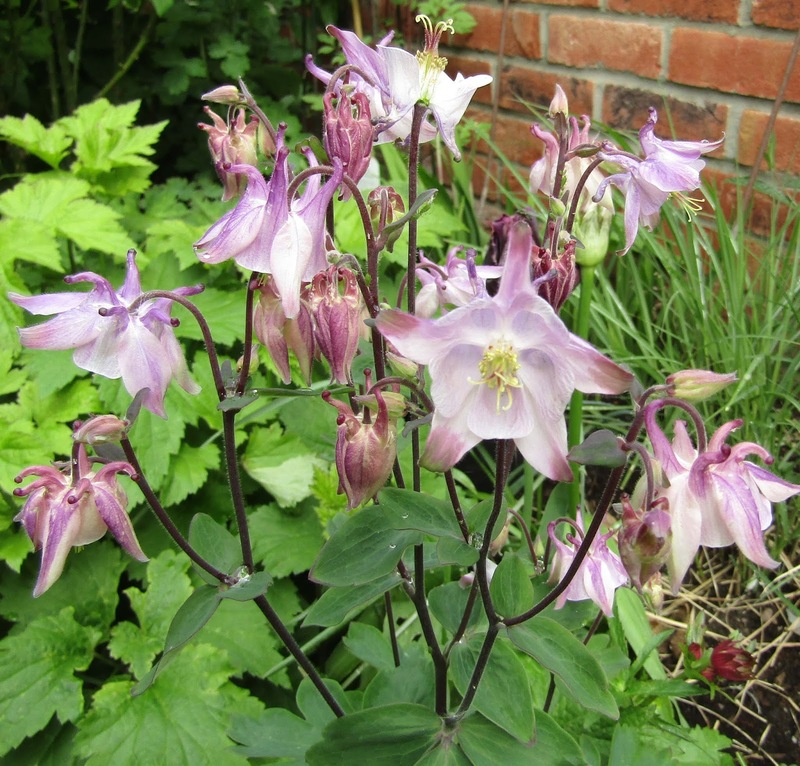 They are very stately plants. Nature has the BEST colour palette doesn't she? Her galleries are spectacular too. Love your vivid A plants. 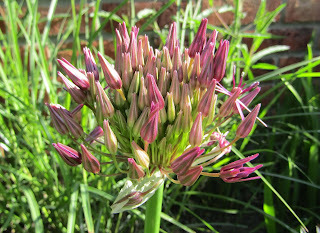 Thanks, EC, Yes she does - no matter how hard I try with my planting combinations, she always manages to beat me. (I don't mind that much when the combinations are so beautiful). Those flowers look stunning, and I love them. Thanks, Poirot. 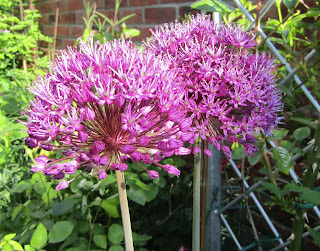 The alliums are having a very good year this year and I think I shall be buying a few more in the autumn. Thanks, Chrissie. I do love roses and have quite a few squeezed into my garden, both in the borders and in pots. How lovely to be enjoying the oleander too. Oleanders remind me of one of my favourite books, The Enchanted April, by Elizabeth van Arnim. I really like the BBC adaptation of the book too - it is just magical. Thanks, Sandy. I really like both Irises and Lilies, but they have never done very well for me and lilies and cats are not supposed to be a good combination. I do enjoy seeing them in other people's gardens though. I watched very little of Chelsea this year, I only caught snippets here and there. 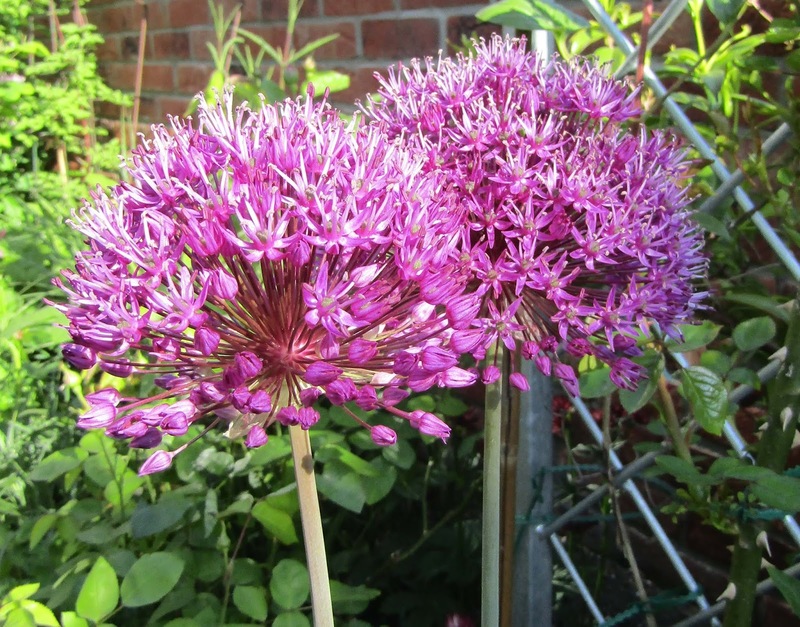 Your garden is looking lovely, I have alliums and aquilegias in my garden and an astrantia has been on my wishlist for ever but I still haven't got round to getting one. 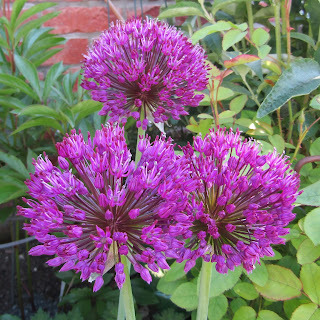 I've got a gorgeous lemon yellow aquilegia, it's my favourite, but the alliums are striking, aren't they? I love your combinations, especially the one with the rosebud. Thanks, Jo. I seem to have collected lots of astrantias now and the dark red ones I bought at RHS Chatsworth and the ones given to me by a work colleague are doing really well. (I didn't realise that the dark ones do like a bit of sun). 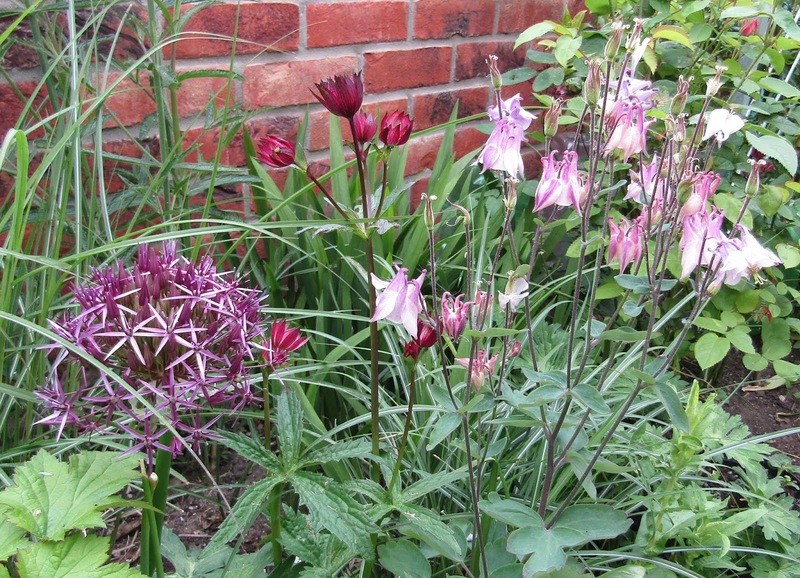 The combination of the aquilegia, alliums and rose isn't really much to do with me - nature put that one together and I have been really enjoying it. I still have a long way to go as a gardener but I do enjoy learning!